Living Area 7005 Sq. ft. Builder's own custom home has every feature you could want. 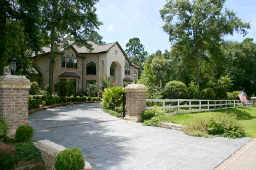 Features 5 bedrooms/5.5+baths/3 car attached garage; outdoor kitchen with double Jen Air convection ovens and a lovely stone fireplace; interior of home features marble and Brazillian hardwood flooring; spectacular chandeliers; awe inspiring foyer/entry; extensive mill work; game room with mahogany bar and a 72" TV.